Betty Hay Freeland is one of Hawaii’s most highly regarded artists. 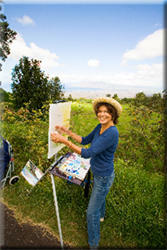 Her compelling Hawaiian impressionist oil landscapes are widely collected. She began her career ‘en plein aire’ and continues outdoor painting throughout the state of Hawaii capturing the staggering beauty of Hawaii with a tender touch.